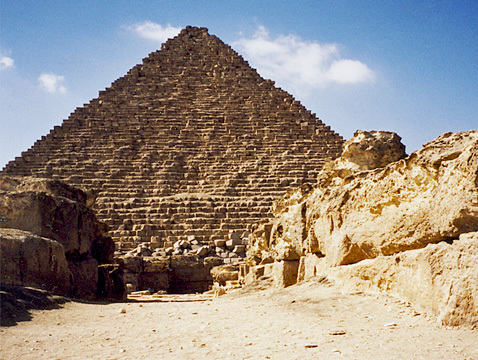 Then we talk to the third pyramid of Giza, which is attributed to Menkaure ( Mycerinus in Greek), who reigned Ancient Egypt from (2494-2472B.C). So we talk about the 3rd pyramid of Ancient Egyptian Pyramids in Giza Menkaure Pyramid (Mycerinus in Greek) , Menkaure Pharaoh reigned Ancient Egypt more than 22 years (2494 - 2472B.C)to know more details about Menkaure Pharaoh you can visit this articles Menkaure Pharaoh 2494 – 2472 BC | khamerernebty , Pyramid and facts , Menkaure's Pyramid is much smaller than the other two pyramids of Khufu Pyramid and Khafre Pyramid . Menkaure's pyramid is only 8% of the size of Khufu's Pyramid ,even though Menkaure reigned for 18 Years, and had plenty of time to finish a pyramid as big as Khufu's of Khafre's. The size was probably not his objective. his pyramid is just a piece of the master plan , started by Snefru. It is also possible that his predecessors had depleted the mineral resources needed to build the pyramids. Are there other indications of depleted materials? Yes. Menkaure's mortuary temple was left unfinished. Also we notice from Menkaure's time on , a noticeable reduction in the use of stone for building, and the extensive use of crude brick and other perishable materials, throughout the funerary complexes. So, this Pyramid, like the other nine pyramids, is anonymous. That is right - no inscriptions anywhere. Only the account of Herodotus, and references in the surrounding mastabas, to his name, make him the likely builder. The casing blocks here different than the other two Giza Pyramids. The lower half of the casing blocks are made of rough granite (possibly craved from natural quarries) , except at the northern face of the pyramid, around the entrance and in a corresponding area on the eastern face, where they are fine granite. How about the top half of the casing blocks? The top half of the pyramid was fully dressed with the fine-grained limestone, but had stop because of the great expense. How about the interior here ? 1- The (upper) first passageway has its entrance, as usual on the northern face of the Menkaure's Pyramid , and its entrance is13' (4m) above the vase of the pyramid.This descending about 102'(31m) . The sloping section leads into a horizontal passage, which in turn , leads into the first inner room. 2- The second passageway is cut underneath the original upper passageway. 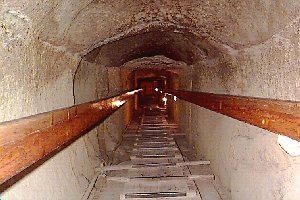 The lower passageway is the one we use to enter the pyramid and it is lined with granite. It is also, as usual. pointing to the celestial pole. The lower passage leads westward to a staircase, then down to a room containing six niches (called the Celled Room) . Still further est, lies the main underground room. Why was the passageway lined with granite ,since it was in the bedrock? We can't explain this feature. How about the main underground room? It is cut out if the rock, and once again , it is absolutely lined with red stone and completely avoid of any identities. Its ceiling appearance to be valuated, a excellent barrel vault, but in close to examination , you will find that the ceiling is really formed of great , tightly fitted granite slabs , laid in facing gables. The undersides been designed to form the wrong vault. Was this granite room always empty like that? No. This room contained the only stone chest ,found in this pyramid. It is a basalt chest, with o inscriptions whatsoever. I have not seen it. What happened to it ? It was carried out earlier this century, to be shipped to England , but was lost at sea , off the Spanish coast.